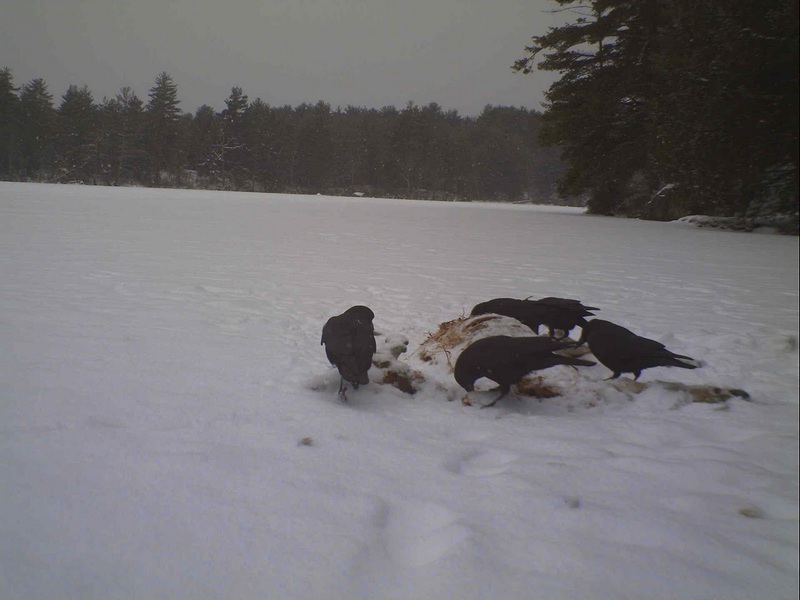 Well, it’s nature in action, but it’s still hard to see – the deer I was observing last week has most likely concluded its life here at Lake Wicwas. This week a coyote took down a deer right in front of our house. It wasn’t a pretty site, so I won’t show a lot of detail, but still, consider this a mature audience warning…. We first noticed the carcass out on the ice, and went out to study the situation. We were able to follow the peaceful track of the deer as it as browsed along the shoreline, having no idea it was being stalked. 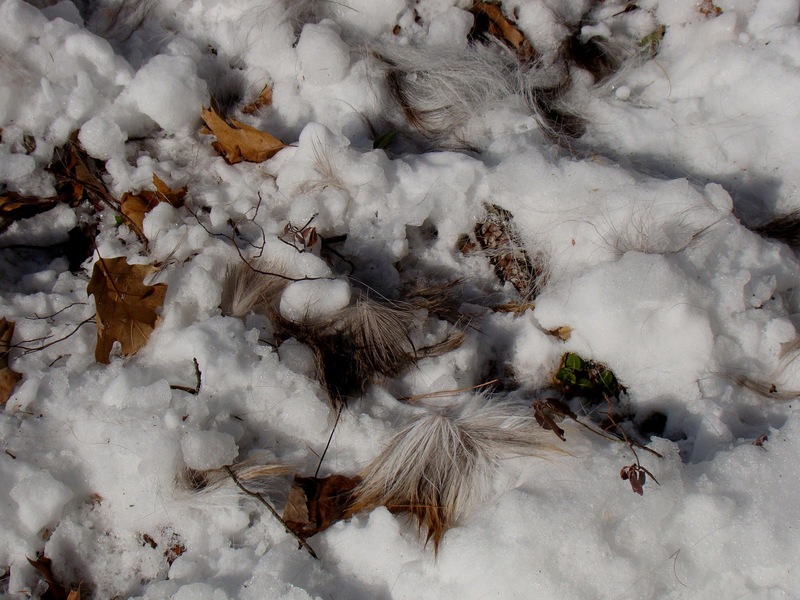 Suddenly the calm track turned into a frenzy of hoof and canine prints, accompanied by large tufts of fur. 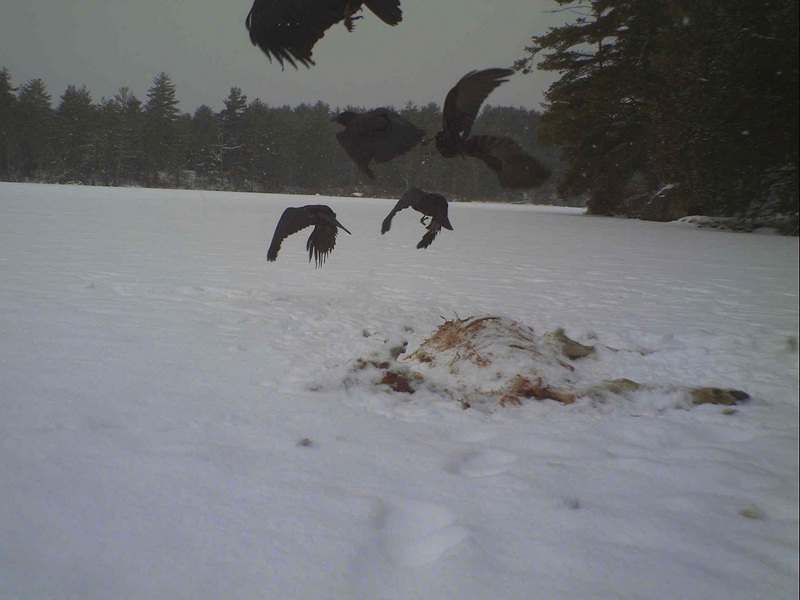 This went on for a good stretch, before they moved out onto the lake, which was not a good move for the deer. 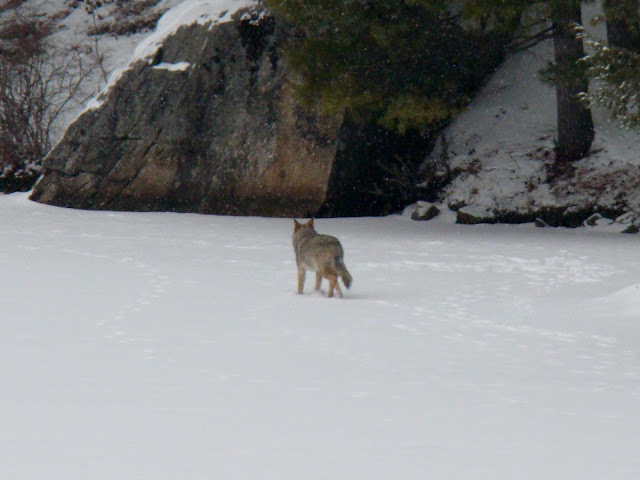 On the ice it had even worse footing, and there were many times when it fell onto the ice, probably providing the coyote opportunity to attack its neck rather than just its legs. 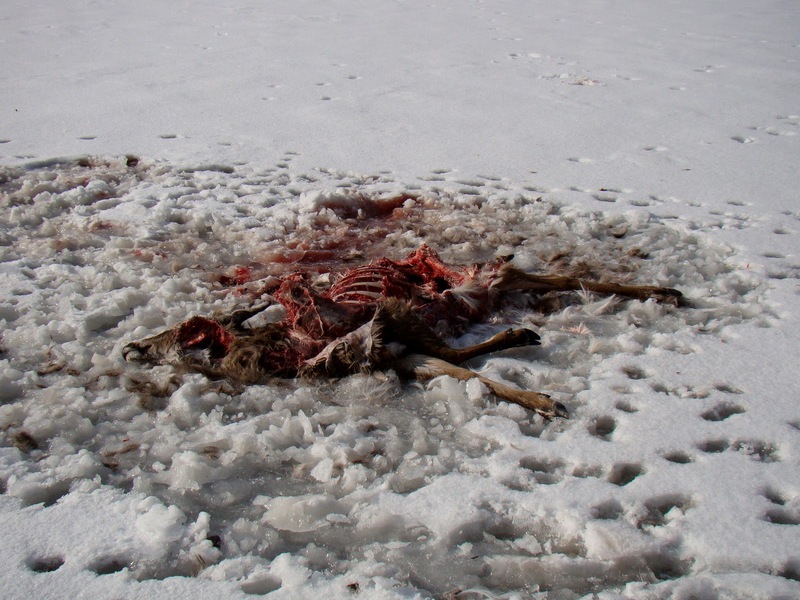 Not that it really mattered – with the hard going even on land, the result was determined as soon as the coyote detected the deer. 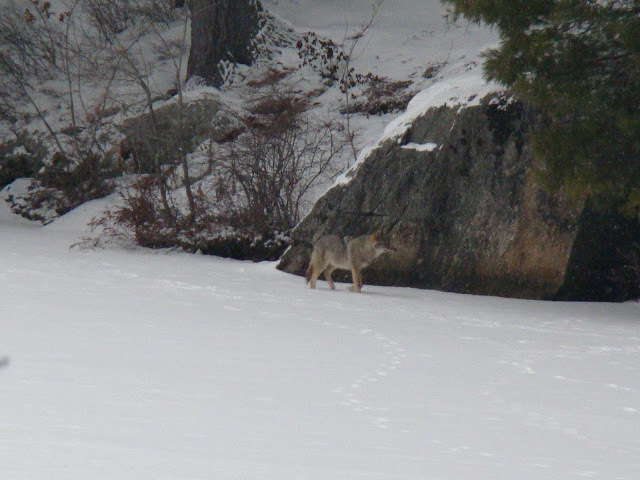 Although coyote will hunt in packs, I’m guessing this was a lone coyote, as only one of the deer’s legs was damaged, and we only saw a single coyote on later days. 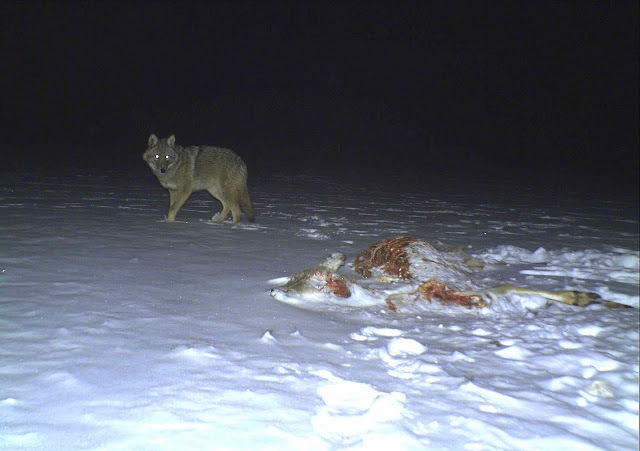 Once killed, the coyote started with the large parts of the animal, and over the next few days, worked its way through the less desirable parts. Over the next few days there was a steady stream of visitors, and the carcass slowly eroded away. This is probably the hunter, but there’s no way to be sure. 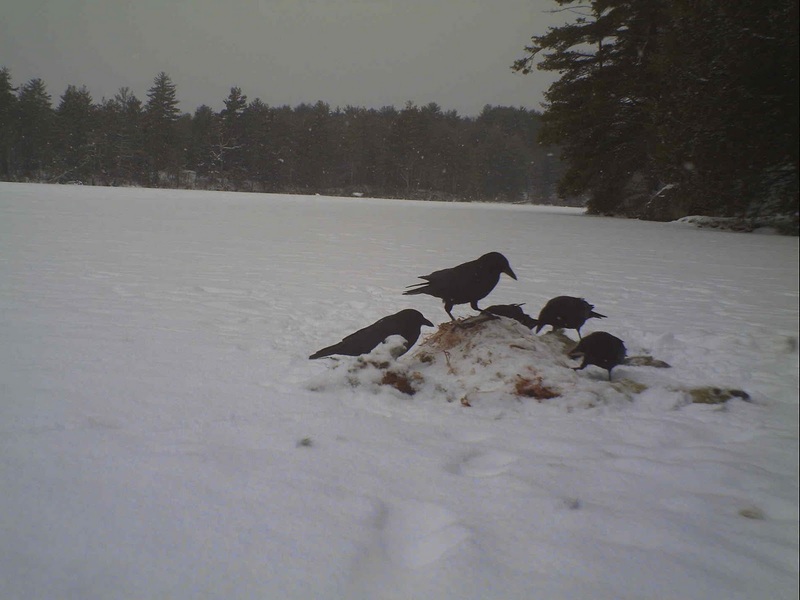 Most of the visitors came at night, but there were some daytime visits, including frequent calls by the crows which are picking the bones clean. We did not see any eagles joining in, though it doesn’t mean they weren’t there. I also saw fox prints along the shore, but no signs of it approaching the much larger predators prize. 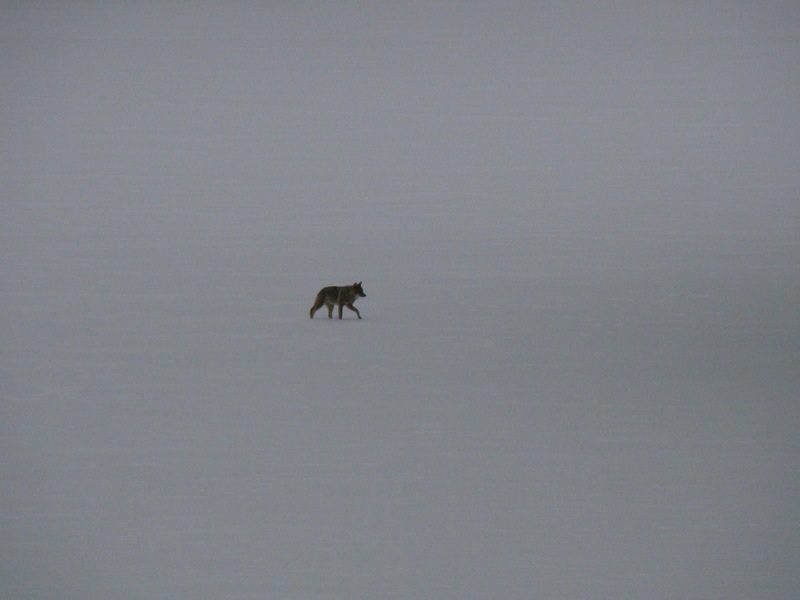 On this daytime visit (1:45pm) the coyote walked back and forth, but never approached the carcass, as it appears to have detected our motion, even inside the house. 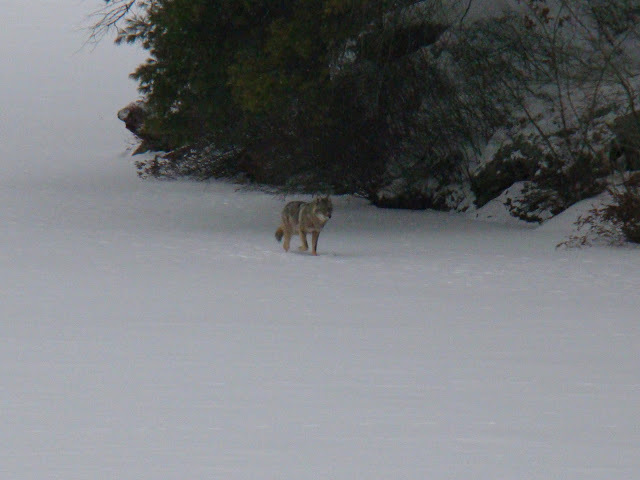 It nervously paced the area for five minutes before heading off into the woods. 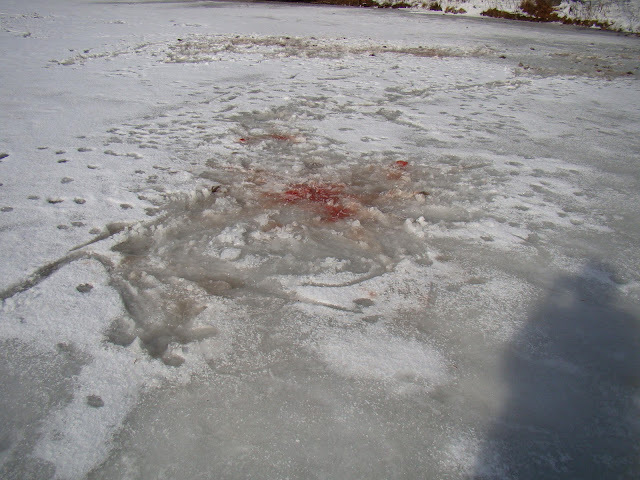 The deer should have been so cautious. Of course, I don’t know for sure that it was the same deer I tracked last week, but that particular animal was clearly not as wary as most. To be out in exposed areas when travel was so difficult is unusual; in those conditions most deer stay within their well protected and hidden deer yards. Those that don’t have that instinct don’t tend to pass their traits on into the gene pool.